Perhaps you’ve wondered what your home is worth in today’s market but you didn’t want to go to all the trouble of hiring an appraiser or interviewing real estate agents to find out. 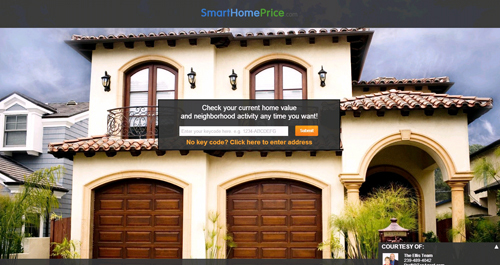 Now there is an easier way to find out what your home is worth online. 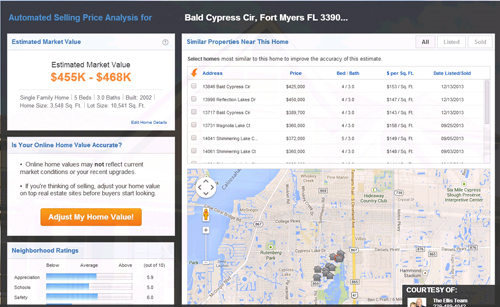 Simply go to www.swfloridahomevalues.com and enter your property address. The system will analyze your home and you can verify that it has your square footage, bedrooms, bathrooms, and year built correct. If anything is not correct you can make changes. Once you confirm details it will calculate your home’s value. Sometimes we find it is low and your home is actually worth more than what the report says. Others times it’s been high, but in any event we hope it’s a good ball park estimate based upon what’s selling in your neighborhood. The system should even update you when more recent home sales hit the market and it’s able to recalculate your price based upon the new sales. 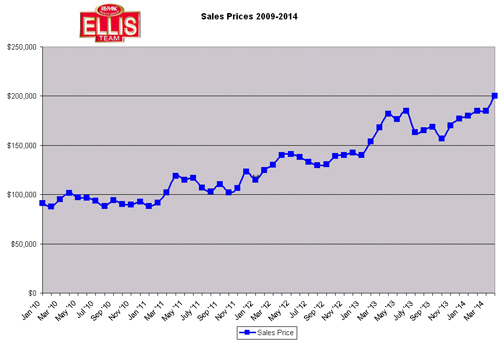 We had a seller who didn’t like the initial price but once some higher priced sales came in they were ready. The system alerted them to those new closed sales. No online computer system is ever perfect. This tool is designed for those considering selling to weigh their options to see if the possibility even makes sense. If you’re struggling to make a decision, or need more information on how the process would work, there is no substitute for having a top professional come out and value your home and talk you through how the process would work. We know you may want to purchase another property but can’t until you sell your current home. Many sellers don’t want to move twice so timing is also an issue. We can present you with some options that might make it easier for you to decide. Taking advantage of today’s low interest rates might be an advantage for doing this now versus waiting. Often times sellers will wait for their home to go up in value all the while the next home they want to purchase is also going up in value. Waiting may be a wash on values, but it could cost you when interest rates increase. Our new Marketing in High Definition program has been a big hit with sellers. For more information go to www.HomesInHD.TV We are now filming homes inside and out using High Definition Video. We also use a drone to film overhead video in High Definition and take amazing aerial photos. Buyers love the new technology and really study our listings. Google loves the new format and ranks videos higher than standard virtual tours. We still do standard virtual tours that generate a lot of traffic; we’ve just added the new High Definition Video for even greater visibility and buyers are responding. Here is an example of a home in Reflection Lakes we produced in High Definition. Here is a beautiful golf course home in Olde Hickory we produced in High Definition. 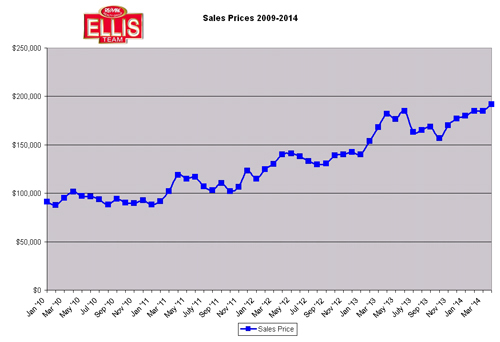 The Ellis Team is proud to announce a new way to market real estate in SW Florida. We are now Marketing Homes in Hi Definition in SW Florida. Technology has changed the way people view TV shows, movies, and content over the Internet. Today companies like Netflix stream TV shows and movies direct to people’s homes or mobile devices. People’s expectations are changing about how they want content delivered. For the first time the Ellis Team at RE/MAX Realty Group is bringing cutting edge technology to SW Florida and combining it with High Definition video and studio production editing. The Ellis Team already ranks very high on Google. 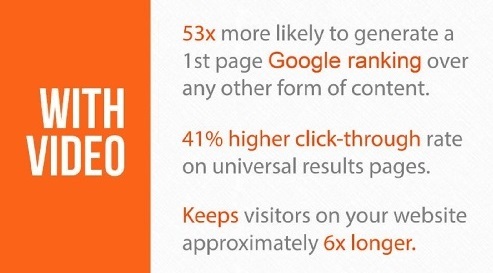 Video is 53 times more likely to generate 1st page Google ranking over any other form of content. Video provides a 41% higher click-through rate on universal results pages, and keeps visitors on your websites 6 times longer. 73% of sellers say they are more likely to list with an agent who uses video. However, YouTube is filled with videos shot from cell phone cameras and terrible audio. Consumers expect studio quality video, and when you provide that companies like Netflix flourish. We think quality is important. Video also allows us to tell a story about your home. If a picture is worth a thousand words, how much is a video worth? We’ve added a drone to allow us to take full motion high definition video of your home and community. The drone adds perspective we just can’t achieve from the ground. We’re able to show the lake behind your home, the golf course, property boundary lines, and proximity to landmarks. Buyers love seeing homes from a bird’s eye perspective. We also take stunning aerial photos from the drone. We don’t stop there. We add professional high definition video from inside the home as well. Lastly, we compile the inside and outside video footage into a well produced video and upload it to various websites and YouTube. We’re adding a Featured Homes in HD playlist to our YouTube channel which is already one of the most viewed YouTube channels in SW Florida. To date we’ve received over 200,000 video views and this number will grow quickly with the addition of High Definition Property Videos. We’re not the first to use a drone. We’ve been marketing our properties using video for years to great success, so video is nothing new. What is new is combining cutting edge technology like the drone with professional video inside the home, and professional video editing to create the ultimate viewing experience for a buyer. Each video takes some time to film and produce, so if you’d like your home featured in HD, call us now so we can get you on the list. Of course we’ll advertise your home in the newspaper and all the various places we advertise, and we think you’re going to love the new high end video we’re bringing to SW Florida. If you recall back in March and early April we reported that preliminary March Sales weren’t as strong as hoped and indeed the official numbers confirmed that prices weren’t rising in March at a time when they typically do. We are happy to report that April numbers appear to be coming in a bit stronger. Official numbers won’t be reported until later in the month and agents are still changing pending sales to closed and adding final sales prices to the MLS, so it’s impossible to gauge for sure. As of May 6 we are seeing median sales prices rising to $191,950, up from $185,000 in March and up from last year’s April figure of $182,000. Now here’s where it really gets interesting. Our phones and Internet leads have blown up the last week of April and first week of May. Contracts are coming in very strong and buyers are buying. It’s stronger now than all of season was. Many have speculated this could happen. Here’s the buzz we were hearing from buyers all season. The weather up North was terrible. In fact, it was so terrible many couldn’t get here. Many waited for the weather to improve and now they’re making the trip to purchase. Many who did make it down are returning. I don’t think we can underestimate how impactful this past winter has been, but it isn’t the sole reason we’re strong. The economy is improving some. Interest rates have risen and are expected to go higher. Many people have been locked in their homes for so long due to negative equity and when they’re finally able to break out it’s like a jail break. We’re seeing locals moving up, down, and laterally. We’re finally returning to a healthy market after years of healing. Are we completely healed yet? That depends on your situation. Some are still in negative equity so they would say no. For many the answer would be yes. In any event, opportunities have opened for those in a position to take advantage, and this is the way it always is. The market doesn’t care what you owe or what you need out of the property. It never has. The market only cares about what a home is worth today. Markets are always on the move and rarely stay constant. The good news is we have a market, and it’s a vibrant flowing market with money on the move. This beats a market where homes just don’t move. If you price your home correctly, there is a market. If you over price it, chances are it will not sell, and that is true in an up, down, and sideways market. It’s always true. It is perhaps the only constant in real estate. Some say it’s all about location, and I won’t argue that. I will say it’s all about Price. A home with a better location will fetch a better price. If you over price the best location, it will sit. Conversely, the worst location will sell too, at the correct price. So, location is secondary to pricing. If sales like this keep up we may head back to a market where the summer months are the best months for single family home sales. In the old days Season was best for condos and the summer months best for single family homes. SW Florida used to be a year round market and we may be returning to that. Summer sales never left, but they may actually rise going forward. The other day someone on Facebook asked “How do you know what questions to ask when hiring a Realtor to sell a home?” It reminded me that we have a page on our website www.Topagent.com in our sellers section a list of interview questions to ask before hiring a Realtor to list your home. 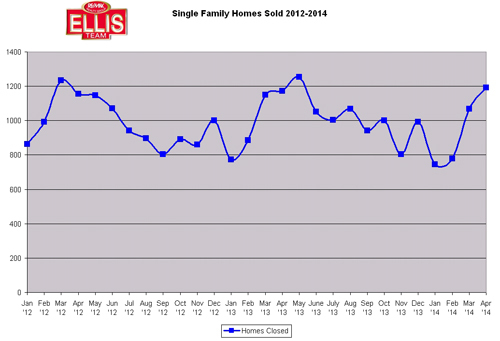 1 How many homes did you sell last year? 2 How many homes have you sold in my neighborhood? 9 Is there One thing you can do for me that Nobody else can? 47 Is it a good idea for listing agent to accompany all showings for my home? 42 Do you give advice on how to properly show my home once it is for sale? 32 What advertising do you as agent provide separate from what your broker provides to all the agents in your office? 28 If a buyer calls on my home while you’re out on appointment, do you have buyer agents on your team available to show my home so we don’t lose the buyer? 15 Do you have your own website or a company provided one on their domain? 16 If you have your own website, is it a custom website you manage or a template website? 18 How do you achieve top search engine rankings when everyone else is vying for those top spots? 11 Do you place the MLS on your website, and will my home be a featured listing? 5 Do you have your own YouTube channel and why is that critically important? 6 How many views does your YouTube channel generate? 7 How will my home be featured on your channel? 3 Do you have an online listing portal where I can sign in and see all the activity on my home? Showings, marketing, copies of the ads, feedback, etc. 27 Where and how often will you advertise my home? 29 When buyers call your office, do they talk to a machine or a live, friendly human trained to help them? 36 Does your company have a national advertising campaign to attract buyers? 38 Do you have your own newspaper advertising space or do you share space with a bunch of agents? 43 Will you list a property at a higher price than you know it can sell for? 44 Do you price your properties for top dollar, or do you under-price them for quick sales? 48 Do lenders work hard for your clients, or put you on the back-burner because you’re hard to deal with? For a complete list of questions to ask your Realtor before signing anything, visit www.Topagent.com and look in the sellers section. 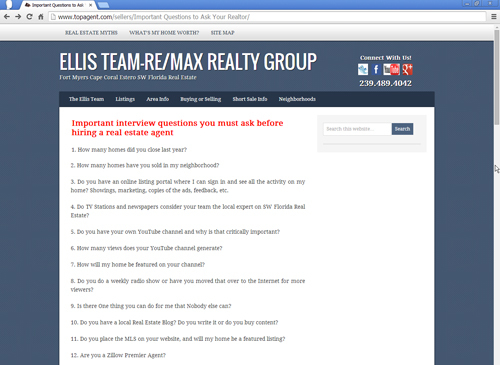 For answers to these questions, call the Ellis Team 239-489-4042 and we’ll be glad to share the right answers with you. Asking some of these questions will make the agent you’re interviewing uncomfortable. You’ll begin to understand which ones understand their Internet presence, which ones have closed a lot of sales and have experience in your neighborhood, and which one rely on what their broker provides and tells them.